Save scanned OLM files for further use. Option to search emails within the result after scanning. No, Size limitation for viewing or scanning any OLM files. If you are using Outlook on your Windows local machine, then you cannot open any OLM files until and unless it is converted into PST. 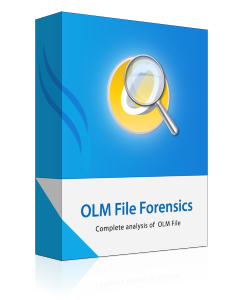 But, the OLM file forensics tool provides you an efficient way to preview OLM files in all extent. Even it allows investiagtor to preview all contacts, task, calendars, and email message along with attachments etc. While performing a quick scan on OLM files, the tool loads all the folders of OLM files consisting of emails like Inbox, Sent Items, Deleted Items, draft, etc as well as the tool also shows the associated properties of OLM emails such as email address, subject, received, sent data, Deleted items, Draft, etc. As soon as the scanning of OLM files completed, the OLM file forensics tool provides you the option of saving scanned OLM files and this option ease the task of user because in case user wants to open the same OLM file again, they just only need to open the saved file and view its data. The whole scenario of saving a scanned file will literally help you a lot in saving the scanning time for the same file. In order to examine any OLM files we need to retain intact details associated with each item of OLM emails. Here software plays vital role to make read/unread status same & there will be no loss of any email attachments, meeting, date, appointment's time, etc. Also, the user can also preview the multiple email address, scheduled tasks, comments, etc. Users face the least complication when they used to open OLM files. Even non techy users can also use the software to scan, open and view the complete data of any OLM files. DEMO version allows you to scan, add and preview the evidence available within MAC OLM files. If you want use advance search, go for PRO version. Upgrade to OLM File Forensic Pro for Advance Search. Can, I use the software on my MAC machine? No, Tool is Windows friendly based software so you cannot use it in MAC system. Is there a size limitation in software to examine a bunch of OLM file? No, there is no limitation on size of OLM file that the software can process. OLM file forensics software has been a great help in finding a solution for email analysis of OLM file, the search and saving option in the software really deserve an appreciation. I can now examine MAC data (olm file) using the Windows forensic software. After using OLM File forensics tool, I feel that the tool provides an accessible interface for novice user also. I must say Thanks to Revove Group for launching such fantastic tool for analyzing MAC data.